Do you have plans to support synchronization using OneDrive instead of just DropBox? Yes it is planned and will be implemented when there is a library for the development system which I'm using for Android. 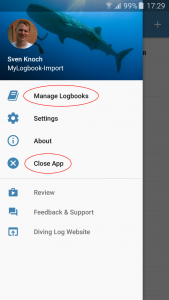 You can use the official Microsoft OneDrive app to upload and download your logbook file from the "Diving Log" folder on Android to the "Divelog" folder in OneDrive. Great, perhaps this would help. The problem is that I'm using B4A, which needs a special wrapper around normal Android Java libraries in order to use them. Perhaps then you could use the REST API directly, if you are familiar with http requests. Yes, that would be possible if no library will show up. 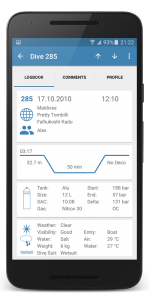 I try to avoid that because it's a lot more work and adding download support to the Android app has a higher priority for now, but I will use the REST API if there is no solution available in the future.